Are you afraid of zombies? Do you have the feeling that they might come barging in any minute now? Then you probably would be interested in Zombie Invasion. It is a program that is supposed to give you a warning about an impending zombie invasion. Sounds great, doesn’t it? Unfortunately, we cannot guarantee that Zombie Invasion does its job well. In fact, it probably isn’t worth a dime because it is an adware application that simply wants to generate financial profit. You are strongly recommended to remove Zombie Invasion from your computer if you want to avoid serious security issues. One of the main problems of this application is that users can easily download it at the main website. You can access Zombie Invasion’s homepage via watchzombieinvasion.com. When you can download a program directly, it is clear that it is not a malicious infection. However, when it comes to Zombie Invasion, the program can also be distributed bundled with freeware. After all, it is a direct clone of Zombie Alert, and a program very similar to TV Wizard, Blasteroids, and Meteoroids adware. The program is based in Injekt engine, and it is obvious that it has been created to display commercial advertisements. Naturally, the main “objective” of Zombie Invasion is supposed to be informing you of the incoming zombie threat. However, this program is a freeware application. This means that it needs to support itself somehow, and it does that by displaying commercial ads. Our research shows that it displays ads periodically, and it does not install any browser extensions. Most of the ads will be related to your most recent web searchers. This only proves that Zombie Invasion collects information what websites you visit and what you search for online. Although a lot of reliable websites and applications do that, you should not tolerate this behavior, especially if it is exhibited by such a fishy program. It is in your best interests to remove Zombie Invasion immediately. Open Control Panel and uninstall the application manually. It should be enough to terminate it. Nevertheless, there might be other unwanted applications onboard. As mentioned above, Zombie Invasion can also come bundled with other software. If you have no idea where to look for the unwanted applications, scan your system with the SpyHunter free scanner. The scanner will provide you with a list of unwanted applications in no time, and you will be able to remove them automatically. Afterwards, invest in a licensed antispyware tool to secure your system’s safety, and stay away from unfamiliar websites that offer shady software! Move mouse cursor to the bottom right corner of your screen. Open Uninstall a program and remove Zombie Invasion. Go to Uninstall a program and remove Zombie Invasion. 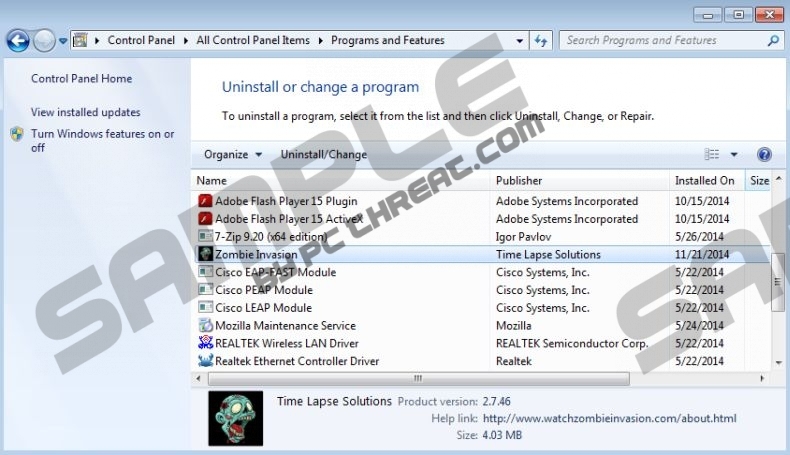 Select Add or remove programs and uninstall Zombie Invasion. Quick & tested solution for Zombie Invasion removal.